As video ad monetization continues to grow across the board, marketers and agencies are increasingly focusing on social venues such as Facebook, Snapchat and Periscope—the last of which launched a video ad platform in Q2 2016. Hulu discontinued its web-only, ad-supported streaming tier to focus on subscription-based monetization. The current quarter saw a continuation of recent audience patterns, including growth in digital video viewership overall (particularly in viewers of premium-length content), erosion of the pay TV user base and especially strong digital video adoption among young adults. 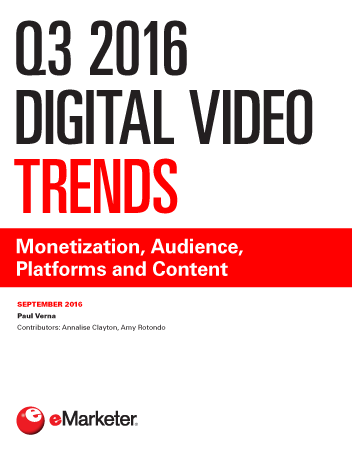 "In August 2016, eMarketer raised its forecast of US digital video viewers to 215.1 million for 2016, up from 213.2 million in our February 2016 forecast. The market is virtually saturated, however, with growth in the low single digits and expected to slow further."